Mitsui Engineering & Shipbuilding Co., Ltd. (MES) completed and delivered a 56,000 dwt type bulk carrier M.V. “OCEAN SPLENDOR” (MES Hull No. 1841) at its Tamano Works on 17th January, 2013 to Mingtai Navigation Co., Ltd., Taiwan. This vessel is a handy-max type bulk carrier of 56,000 dwt with a large cargo hold capacity over 70,000 m3 and marks the 150th ship of its series. 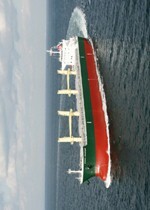 This 56,000 dwt type bulk carrier series of MES is widely called “Mitsui's 56” and is highly appreciated in the market. More than 170 units of this series have been ordered from MES. (a) Good manageable size of 56,000 dwt at the summer draft. (b) Length and draft in consideration for accessibility to world main ports. (c) Low Fuel Oil Consumption based on good propulsive performance. The vessel has five (5) cargo holds and four (4) cranes for handling cargo. In order to load various kinds of cargo, the vessel is designed to have enough strength of tank top of cargo holds and to be suitable for efficient cargo handling. (a) The size of hatch opening is the largest for this type of vessel in terms of both length and width. (b) Each cargo hold has a sufficient clear length in order to load long pipes. (c) Cargo hold is well strengthened to load heavy cargo such as hot coil etc.